Mother's Day is this coming Sunday here in the U.S. (and perhaps where you live too) which was a big surprise to me when I realized it a couple of days ago! You also? It came along especially fast this year with the 1st falling on a Sunday, and led me to do a quick shift in post topics.... so today I have another card idea that would be a good one for mom. It's pretty safe to say mothers appreciate when their children make them something - no matter the age of the mom or the age of the child. Time might be short before Sunday, but don't let that stop you from trying your hand at this design I devised, even if you're brand new to quilling. The leaves are a mixed bag of sizes, which takes the match-y pressure off. Find the full tutorial at MAKE. Another bit of news... remember Elizabeth Moad and her self-published book, Christmas Quilling? Lots of you have asked how to get a copy here in the U.S. Elizabeth emailed to say that it is now available at The Book Depository. This is an English company, but it ships worldwide with no shipping fee! Not only that, major credit cards and PayPal are accepted! Lastly, I wrote up the pattern for the daisy card on Monday's post since it was proving to be pretty popular - hope you'll enjoy making it. 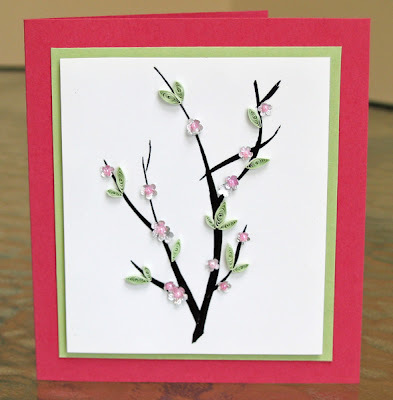 Thanks for this easy card tutorial and the reminder I will be with my mom this Sunday and this looks like a nice idea to try and get my card ready before I leave. Thanks again Ann. I am right behind you Ann....last night I realized Mother's Day was on Sunday and I don't have any cards made for my sales rack (eek). So last night I whipped up a few and (to me) they look whipped up. Every time that happens I say next time I will be more prepared....but then life happens. I have 2 mother's day cards and a birthday card all for the same day. Beautiful! I absolutely love cherry blossoms. It won't be happening anytime soon, but I really do want to try my hand at this card and especially the daisy. Thanks for the pattern! Ann- this might be one of my favorite cards ever! I love the mix of materials and techniques. It all comes together so perfectly, I just love it! Beautiful card Ann.. love it.. simple can be so effective... Have a Happy Mother's Day!! Thanks for the tutorial Ann. This is a really pretty card.